Last week some news appeared on the Internet and became viral. There is nothing really special about it: every week, every day, something shows up and captures the public’s attention. We are willing to find something new, any subject of thrill or laugh. And as it pleases us, we love to share it with our friends. Most of the time we share little silly things (a puppet falling down, some celebrity making faces) that as soon as we share, we forget them, our attention fixed on more serious business or simply on the next non-sense sharable thing. But from time to time, knowing it or not, we hit a raw nerve. It usually comes in the most unexpected form, because we are living strange times and to express real feelings is seen as a sign of weakness; to show that we are not perfect neither we can live alone, that we can’t do it without dreams… is almost forbidden. It seems mandatory to show we live a perfect live, just as it is. But that’s only half of the story. The best part of it is the Planetary Science Director Jim Green answered the letter, encouraging the kid to keep on with his studies. So did NASA’s Planetary Research Director, Jonathan Rall on the phone. 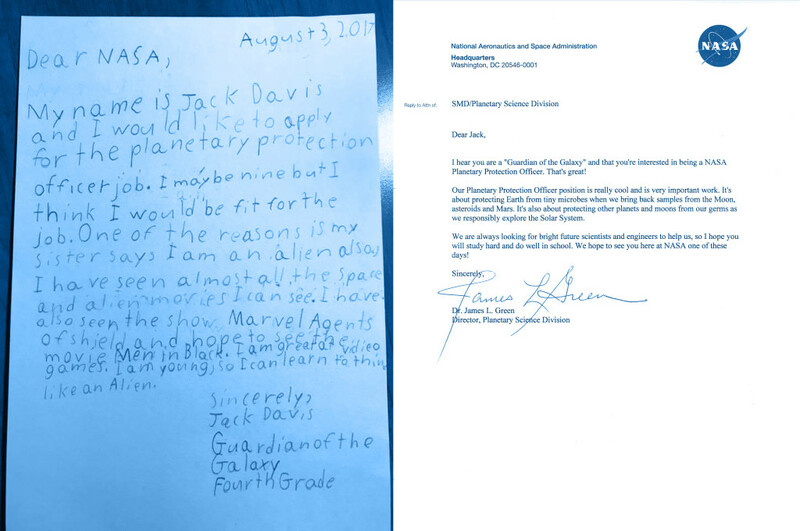 It’s not only the tender letter of this extremely young Guardian of the Galaxy but the answer of these men, serious professionals taking very seriously this boy’s dreams. Because we all want this kid to grow up believing he can be a NASA member. Because we want him to be, some years from now, a NASA member if he wants to. Because all of us would have loved to write that letter and have got that answer. Because we still want to. Because we know dreams can come true. Because they do come true. But you have to go and get them.